It was the Our World Underwater Diving Convention. I rented a booth at the dive trade show to sell my Prairie Starfish videos. In preparation, I flew to Kansas City, rented a van and a lobster costume (of course), grabbed my two brothers, Eric and Mike, my life long best buddy Ed Leydecker, and the four of us drove to the Chicago Hyatt. There we met my graduate student at the time Geoff Trussell, one of his college buddies, and a UNH undergraduate who gamefully agreed to wear the lobster suit at the convention (along with cigar in mouth and cocktail in hand) to help promote the booth where we were selling my Prairie Starfish videos (which turned out to be a rather lame idea for a diving convention). By Saturday afternoon my group had met a whole gang of characters at the event. That evening there was an amazing amazing film festival. I showed my barnacle music video, which went over great, but the highlight of the evening unquestionably was this wildman, Wes Skiles, showing these truly unbelievable movies of his where they descended deeper and deeper into frighteningly cavernous caves in Florida aquifers – it was like an underwater “Blair Witch” movie — truly terrifying. The ballroom was packed with 1000 people, all hushed with fear. My two brothers will tell you to this day it was one of the most amazing films they have ever seen. After the screenings, there were two parties — one for the masses, and a smaller V.I.P. party just for the filmmakers. Being an aspiring schmuck, I abandoned my brothers and friends to “network” among the filmmakers. There was a ton of free alcohol in the V.I.P. room and after a couple hours of boring conversations there were only a few filmmakers left, with cases of alcohol going to waste. But then all of a sudden, and I swear this is the truth, the doors to the room burst open and there was a conga line of AT LEAST 100 people, singing and doing the conga line thing — all having exited the other party to the beat of the music over there, being led by Wes Skiles and, in the second position, my buddy Eddie. The four of us spent the whole next day driving back to KC (actually Eddie slept the whole way in the back), trying to make sense of the night, and laughing our asses off at one thought after another, and at the center of it all was the crazy cave diver, Wes Skiles. That’s about all I knew of the man, except that he was ALWAYS so full of energy and life and enthusiasm in every email and phone call we ever traded. 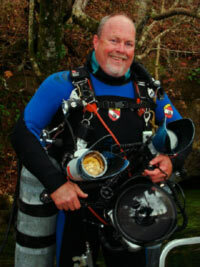 He died on July 21 in a diving accident in Florida. The world is a less fun place without him. He will live on forever in my mind as the guy at the front of that Conga line. Bless you Wes Skiles for all the happiness you radiated to others. P.S. – for a more reverential account of Wes Skiles, this is really good.